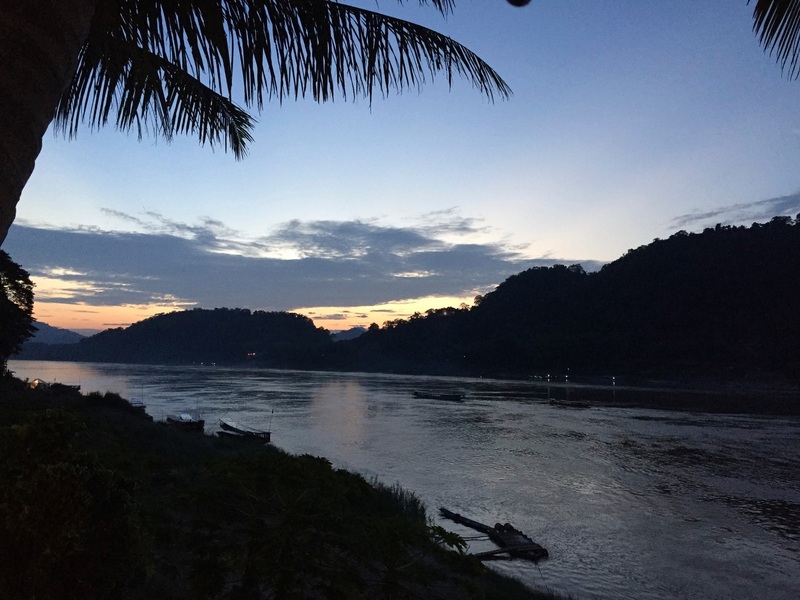 Twilight on the Mekong in Luang Prabang before the Festival of Lights. Make no mistake about it. What Vatican City is to Roman Catholicism, Luang Prabang is to Theravada Buddhism in Laos. Consider Wat Xieng Thong akin to St. Peter’s. Because to approach this UNESCO World Heritage Site city, located on a peninsula at the confluence of the Nam Khan and Mekong Rivers, without awareness of its spiritual life is to miss it entirely. Jan and I knew that the Festival of Lights, or Boun Ok Phansa in Lao, was approaching in mid-October, marking the end of the rainy season. The late summer to early autumn time is a period of intense meditation for most Laotian Buddhist monks. We could enjoy a week off from our hectic schedule with the Hà Nội New Music Ensemble in Việt Nam and Luang Prabang, being only an hour flight away in Laos, beckoned to us again.